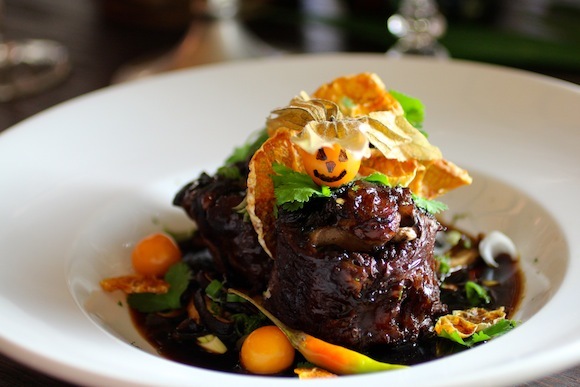 Serve braised oxtail for Halloween? Well, you certainly could. 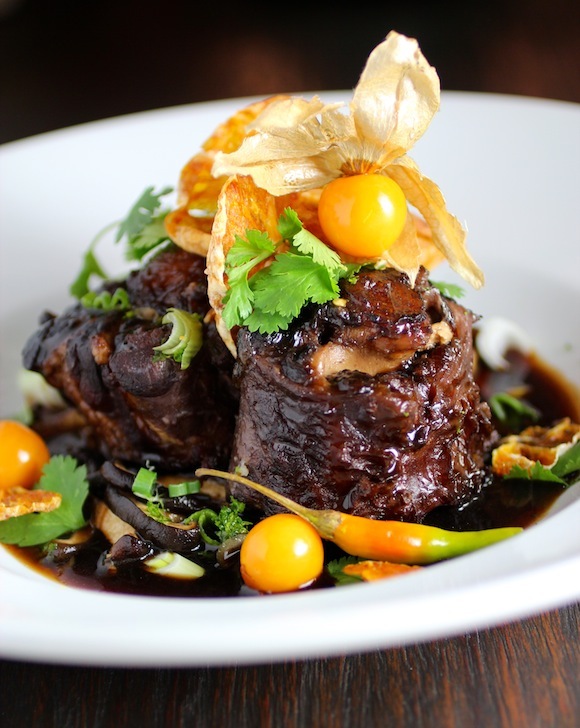 With its rich spicy flavors and warm autumn colors… Oxtails are browned then braised for 3 hours in a two day process resulting in a sauce that is deep and layered and unctuous. 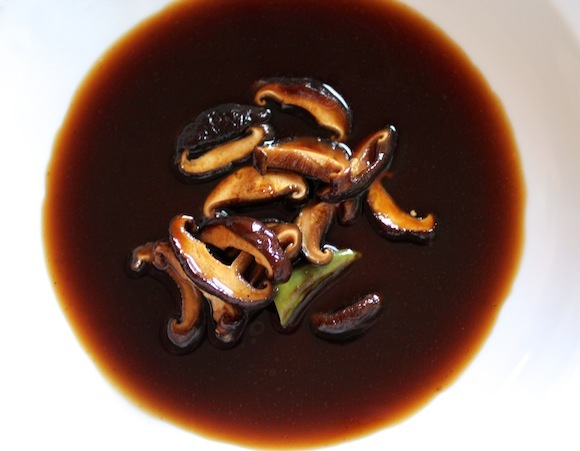 Shiitake imparts earthiness while hot chiles give it a kick. 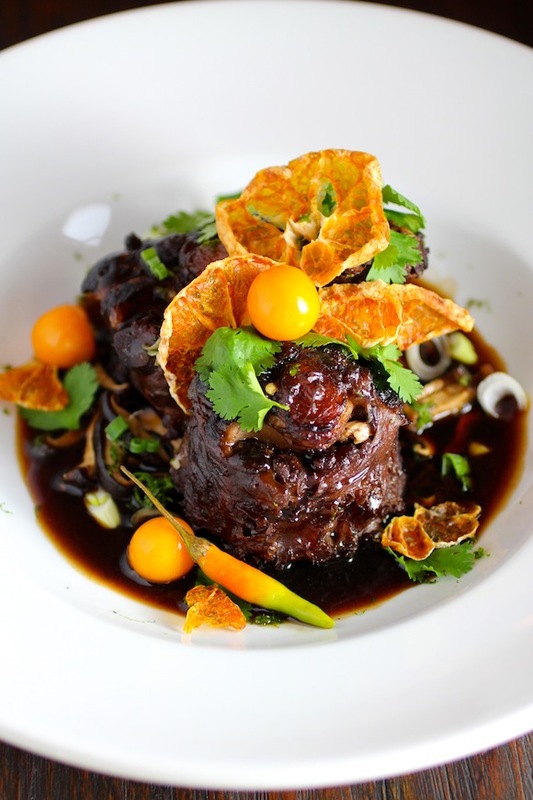 The oxtail is butter-tender but it is really the garnish that puts this dish over the top. Dried Korean Jeju mandarin orange slices add that crispy texture and a sweet-tart component that brightens the meat. 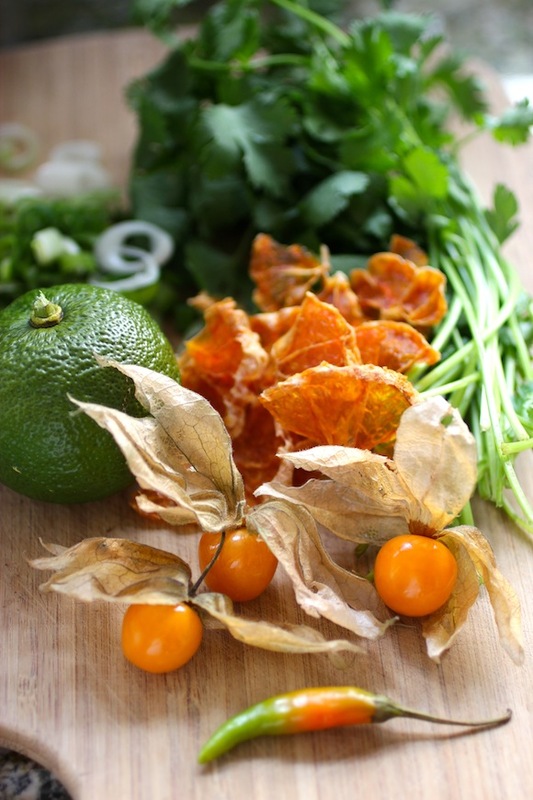 Cape Gooseberries add a flavorful pop while yuzu zest adds bitter-citrusy freshness and cilantro and scallions bring the vegetal notes. Season 3 lbs. oxtail with salt and pepper. Brown in a small amount of canola oil. Place the meat in a soup pot in a single layer. Add the following ingredients. Then add enough beef stock to barely cover the meat. Bring to a boil then immediately turn down the heat and simmer, covered, for 1 1/2 hours. Turn the oxtails over, and continue cooking for another 1 1/2 hours. Add a bit more beef stock if necessary. After three hours of cooking, remove the pot from heat. Let cool then refrigerate over night. The next day – set the meat aside and remove the congealed fat from the top of the sauce. Reheat the sauce then strain through a fine-mesh strainer. Discard the solids and place the sauce in a clean pot. Bring to a boil and add 1 c. sliced shiitake and two hot chili peppers cut in half. Simmer for 10 minutes. Taste for seasoning – and salt and pepper if necessary. Then add the oxtail back to the pot and heat through. The beautiful volcanic Island of Jeju, located off the coast of South Korea, is known for growing an exceptionally sweet, slightly tart variety of mandarin orange. Trader Joe’s markets these mandarins in a crispy form – retaining all their original flavor when they are dried using a special technique. I was thrilled to receive a sample of Trader Joe’s Crispy Jeju Mandarin Orange Slices at the Korean Food Fair held in Los Angeles last week. One of the goals of the event was to bring a greater awareness of the healthfulness of Korean foods to the American markets. Along with their exceptional flavor, Jeju Mandarins are treasured for their healthy goodness. 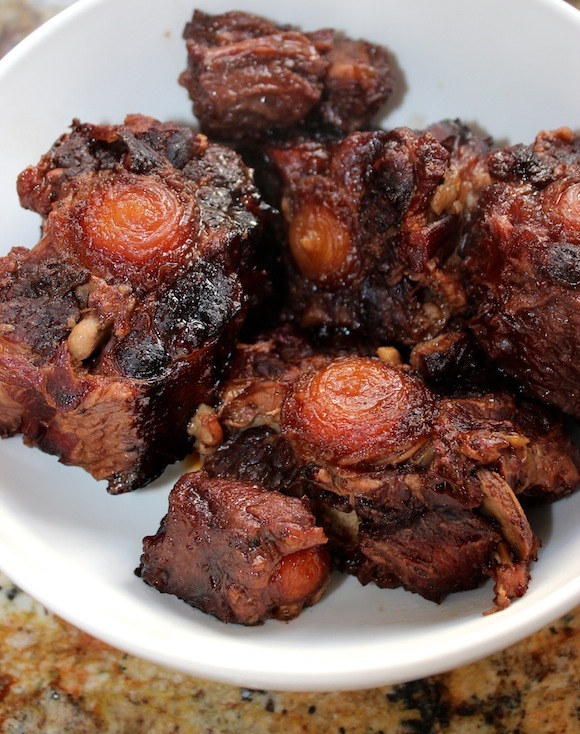 Their bright sweet flavor and crunchy texture certainly enhance this oxtail dish. To plate: ladle sauce and shiitake into large shallow bowls. Place 1 or 2 pieces of oxtail in the center. Sprinkle with grated yuzu zest, sliced scallion, and cilantro leaves. 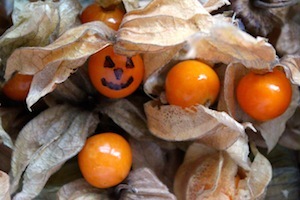 Arrange dried oranges and cape gooseberries around the meat. 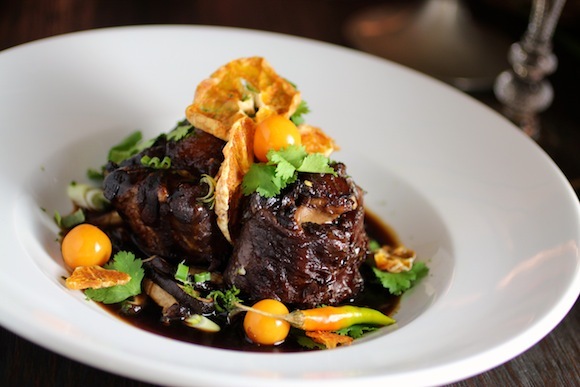 I didn’t think braised oxtail could look so beautiful, but you managed to bring out the gorgeousness here with all those fall-colored garnishes. I’ll take it any season. Oh my, Lori ~ how did you know I impulsively bought some oxtail yesterday with no recipe in mind 🙂 ? I love it but have never cooked it in an Asian manner nor made it a two-day process [hmm, obviously I still have a lot to learn!]. Simply cannot wait to try!! And you have made a ‘plain’ dish look so very appetizing . . . The way that oxtail glistens is just sinful! A gorgeous plate of food.